Dimensions : 2.38 x 1.75 x 3 in. No physical connection to the AC line that is being monitored. Magnetically coupled by passing supply line through protruding current transformer. Heavy duty contacts. The CMB Series relay is used to detect the presence of AC current. When the monitored current exceeds the trip point for longer than 30 milliseconds, the internal relay energizes. When the monitored current drops below the trip point for longer than 0.5 seconds, the internal relay de-energizes. The Delay-on-Release is incorporated to prevent nuisance tripping caused by momentary dips in the load line. An External CT may be used to extend the range of the Current Monitor. The CMB series AC go-no-go current monitoring relay from the ATC Diversified Electronics division of Marsh Bellofram is designed to detect the presence and level of AC current, ensuring consistent levels for the continuous operation of motors, pumps or other critical industrial machinery. 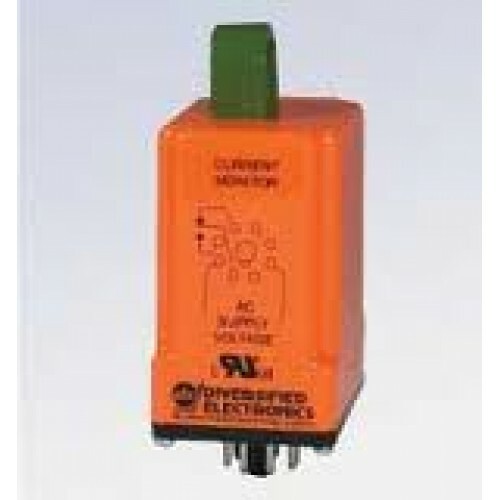 When the monitored current exceeds the trip point for longer than 30 milliseconds, the internal relay energizes. When the monitored current drops below the trip point for longer than 0.5 seconds, the internal relay de-energizes. The delay-on-release is incorporated to prevent nuisance tripping caused by momentary dips in the load line. An external CT may be used to extend the range of the current monitor.